Following the release of their compilation/reissue, A Bureaucratic Desire for Extra Capsular Extraction, Earth is releasing a new album, Angels Of Darkness, Demons Of Light 1. You can find a review of A Bureaucratic Desire for Extra Capsular Extraction at Stereokiller. EARTH have completed their highly anticipated upcoming full-length album, which has been a subject of much discussion over the past two years. Following the band's magnificent 2008-released The Bees Made Honey In The Lion's Skull opus, the next chapter in the ongoing EARTH legacy is ready for public consumption. To see release via Southern Lord Recordings in February 2011, the recently completed new album has been titled Angels Of Darkness, Demons Of Light 1, and promises to be a brand new entity within EARTH's already impressive and constantly progressing lineage. Joining founding guitarist and band frontman Dylan Carlson and percussionist Adrienne Davies, the album lineup this time around also includes cellist Lori Goldston (Nirvana, David Byrne, Black Cat Orchestra, Laura Veirs) and Karl Blau (K Records, Laura Veirs, Microphones) on electric bass. Returning to Seattle's Avast Studios in April and July of 2010 to again work with producer Stuart Hallerman (Soundgarden, Mudhoney, Built To Spill, and Earth2), EARTH's newest masterpiece shows the band continuing to expand on the Americana themes represented on The Bees Made Honey In The Lion's Skull, and even their incredible 2005 album Hex (Or Printing The Infernal Method), taking their sound into broad new directions. 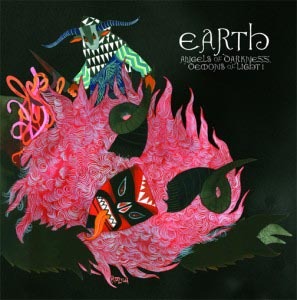 Citing inspiration from British folk-rock bands the Pentangle and Fairport Convention, as well as North African Tuareg band Tinariwen this time around, while still maintaining the thunderous, organic heaviness of previous EARTH releases, the material on Angels Of Darkness, Demons Of Light 1 is more fluid and melodically oriented in nature, relying on more textured patterns and a greater emphasis on improvisational songwriting tactics. This, as well as the inclusion of cello and other experimentations from the musicians involved, culminate into some unforgettable new hymns. The album was mastered by Mell Dettmer, who also remastered the recent re-release of EARTH's first recordings in the form of A Bureaucratic Desire For Extra Capsular Extraction, released by Southern Lord in late October.